COLORADO SPRINGS, Colo. — Shrinking government budgets, combined with a growing reliance on space assets by the United States — especially by its military — are putting the country in an undefended position, Gen. William Shelton, commander of U.S. Air Force Space Command, said today (April 9). Every U.S. military action depends on space capabilities such as satellite-based surveillance, communications, and mapping and weather technologies, Shelton said here at the 29th annual National Space Symposium. Yet the satellite networks that provide these services are "fragile" and spread thin, and there are no backups for these technologies if they were to fail, Shelton stressed, at one point describing the conditions as a "perfect storm"-type situation. "It's like mountain climbers who depend on a very thin rope," Shelton said. "Space was once a benign, much-less-crowded place," Shelton said. "This is no longer true." However, fighting that threat, and bolstering the United States' space resources, will cost money at a time when the federal budget sequester has limited defense spending drastically. "This certainly seems like the potential for a perfect storm to me," Shelton said. He suggested the U.S. space community had reached a fork in the road. "We're going to have to take one of these directions: status quo, or do something different." Shelton advocated reaching a sweet spot between "capability, affordability and resilience," so that the network of satellites the military relies on can maintain — and expand — its capabilities, while becoming more resilient to threats and failures — all within the confines of the limited federal funding available. Some tactics to do that, he suggested, include designing future satellites more flexibly, so that they don't have to be custom-made every time, but instead use existing commercial technologies. 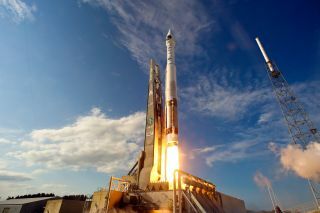 The military might even consider launching some of its instruments onboard commercial satellites, rather than building special vehicles to carry them on their own — a practice called hosted payloads. Yet changing the way the U.S. Defense Department does business in space might be an uphill battle, Shelton acknowledged. "One of the big problems, though, will be overcoming the naysayers that are out there," Shelton said. "There are people that believe that the status quo is adequate. The status quo, to me, just doesn't seem to be reasonable for our future here."